Hello friends, hope you are keeping well. It's going to be a busy few days here on the blog, so I thought I would just get this post in before the end of the month. 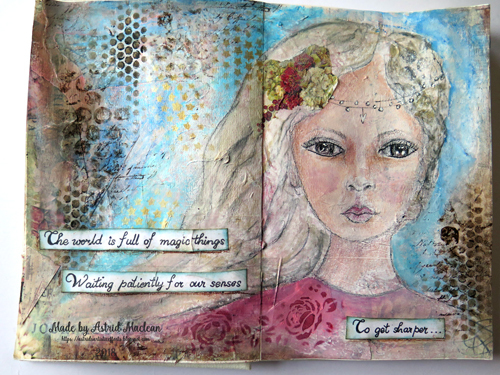 Some of you will have seen the journal cover I made with the journal die by Eileen Hull. Well as promised today I am sharing the first double page. 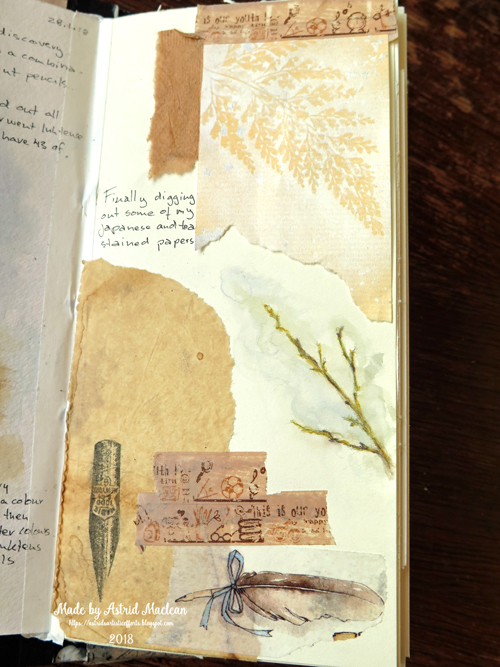 Hand drawn images from nature, combined with washi tapes and other collage elements. 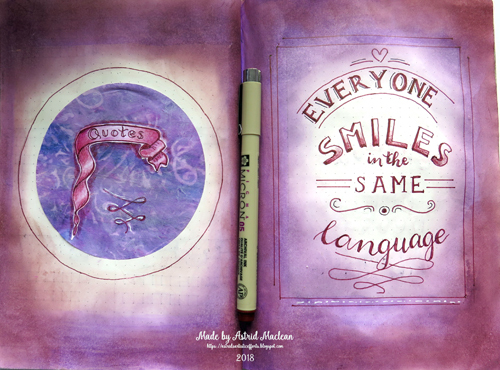 The insert itself was made using a mix of watercolour and drawing paper and the simple 3 hole bookbinding technique. I'll share a few close ups below. 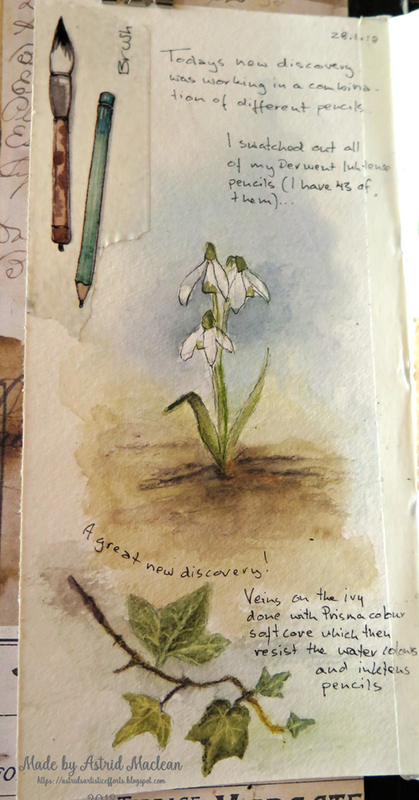 A few snowdrops from my garden and an ivy twig, just for fun and drawing practice. 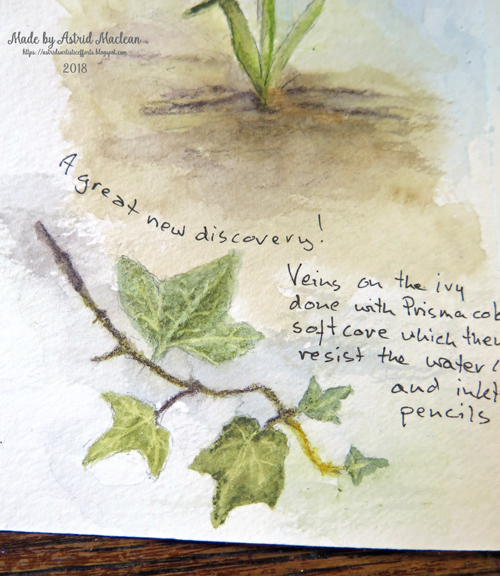 I made a happy discovery while drawing this: I lightly outlined the shapes of the leaves with lead pencil and then drew in the veins with a Prisma Premier pencil in cream. I then water coloured the leaves and found that the Prisma, because it is wax based, resisted the water colour, yay, makes life so much easier when painting leaves! I also used some Derwent Inktense pencils on the branches and parts of the leaves, and despite these being ink based (and permanent when dry) the Prismas resisted them too. 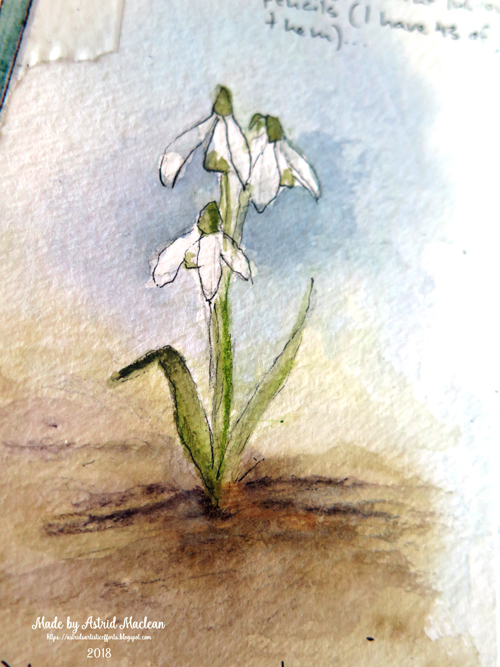 The snowdrops were outlined with a micron pen, which I now really regret, ah well, I'll know better next time. 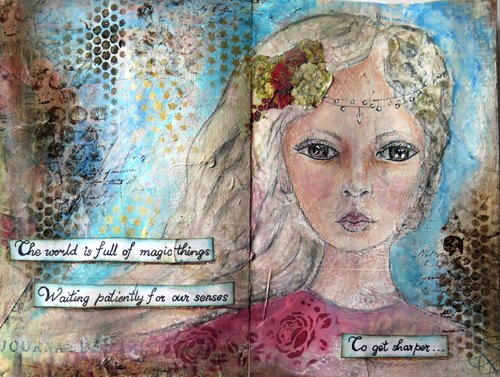 Here is a closer look at the page on the right, mostly collaged with tea died papers, and washi. 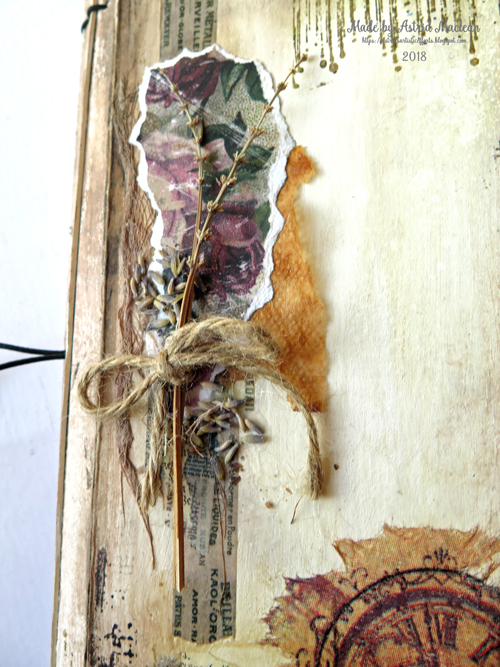 I painted the twig, but the little feather is a srap of a gorgeous washi tape which I ordered on Etsy a while back. Well, that's it for now, I completed the next double page too, but that will have to wait for another time. Hello everyone, thanks for dropping in! 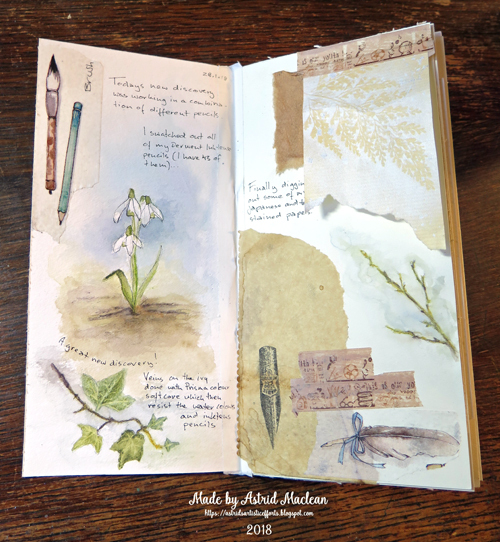 I am sharing a new journal I am working on, a Nature Junk Journal. Today I am just showing you the cover. 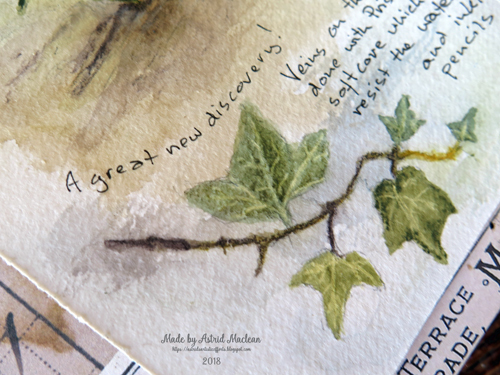 I used the wonderful Eileen Hull Journal die to create my cover, cutting the pieces from mount board. I covered the mount board with gesso, followed by a mix of acrylic paints in Titan Buff, Tintanium White as well as some Raw Umber, all brayered on. 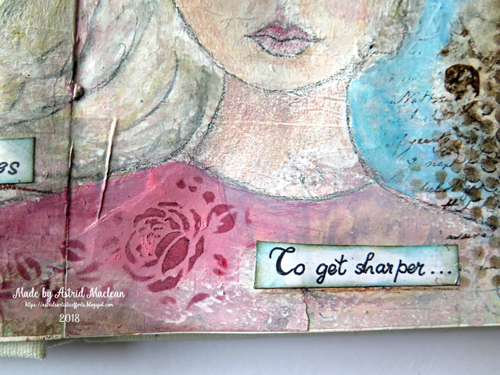 The edges were stamped with a couple of background stamps by Seth Apter and Wendy Vecchi. 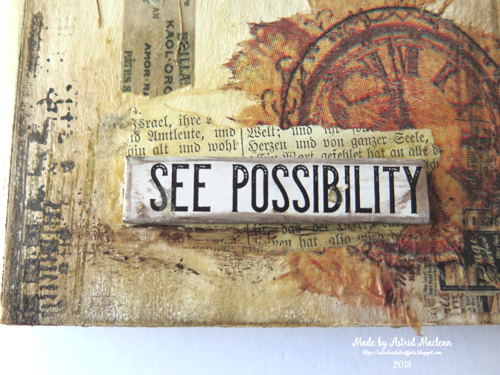 I created a rough junk style collage with teabag and scrapbook scraps as well as some washi tapes. 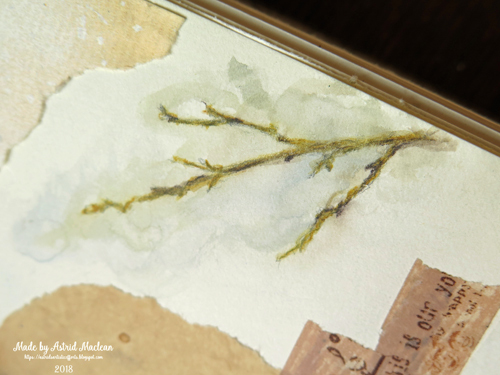 I also wanted to add some dried lavendar sprigs, to go with the nature theme, but all the little flower buds fell of in the process of attaching them, so in the end I just left the sprigs and adhered the little flower heads with gel medium, just adding a bit of texture like that instead. At least it smells lovely lol. 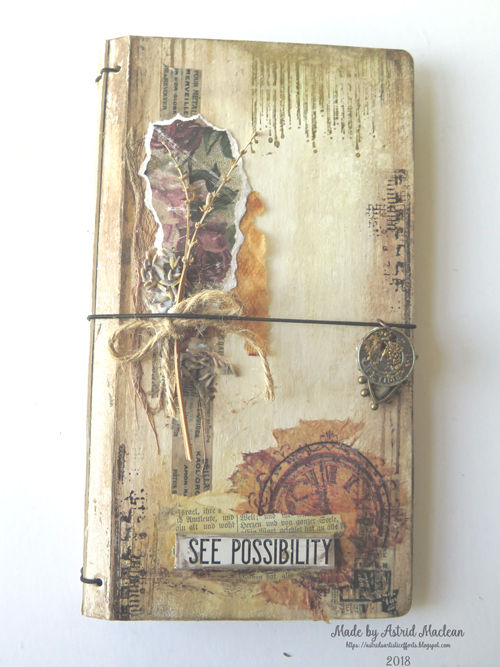 A scrap of book paper, some ricepaper scraps and a Tim Holtz word band finish it all off. So far I have finished one of the inside pages, but I will leave that for another post. I used the simplest of closures for this journal, just some elastic with a few charms attached, through the middle hole that is part of the die. Well that's it for now. I'll show some of the insde on another day. Have a good week everyone and thank you for your visit today. Hello lovely visitors. 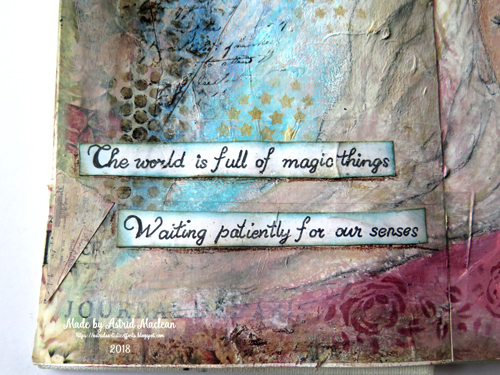 Doday I am sharing the latest piece I created for the classes I am doing with Lifebook. The teacher for this class was Lucy Brydon, who like me live in Scotland. 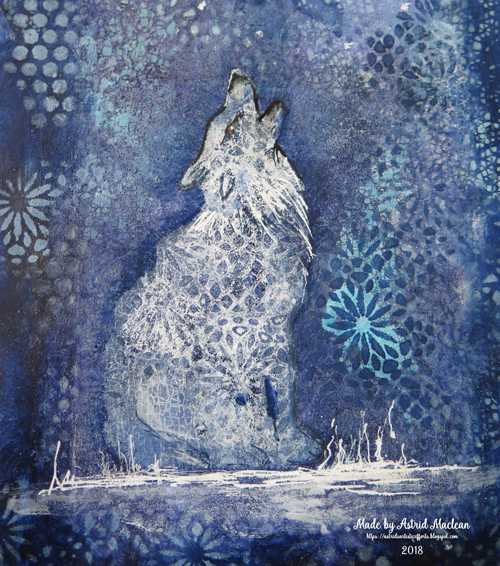 She is a wonderful artist and I fellt really inspired by her class and plan to make one or two more pieces. 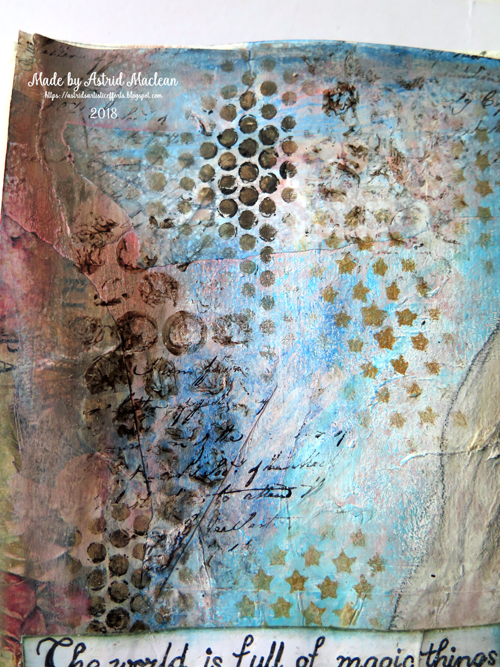 I can't tell you of course how it was done, all I will say is that there was a gelli plate involved. 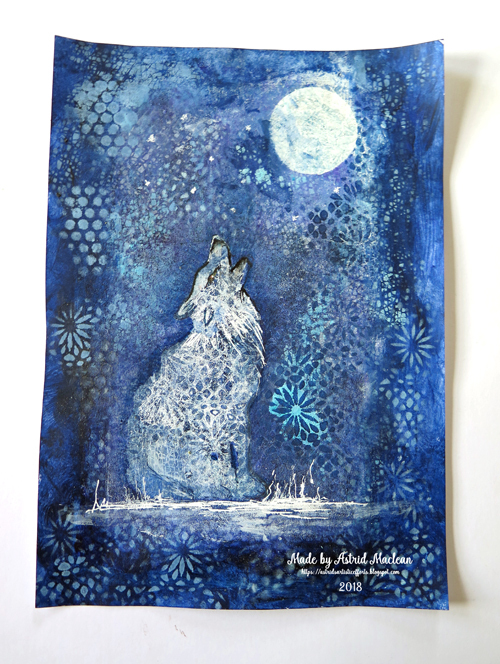 The animal I chose is a coyoti, and of course there had to be the inevitable moon he howls up to. Well, that's iti for today, short and sweet. I apologize for not visiting in the last few days, I hope to do better at the weekend. Have a lovely weekend everyone whe it comes, and thanks for your visit like always. Hello friends and thanks for dropping in. Today I have another quote page in my Bulletjournal to share, again inspired by the work of Valerie Sjodin, in fact I am using one of her own quotes. Next I coloured all the imagerie with Prisma Premier coloured pencils, building everything up with very thin layers. And finally did the background with Gelatos. I found since doing my last page that the best and smoothest way to blend these without using any water, is with sponge daubers. I scribble some gelato on my glass cutting mat (I am sure an acrylic block or none stick craft mat would work just as well). Rub over it with the sponge dauber and then blend it onto the page. The colours just blend beautifully and everything stays really transparent which I love. Here's a close up of the central quote still. 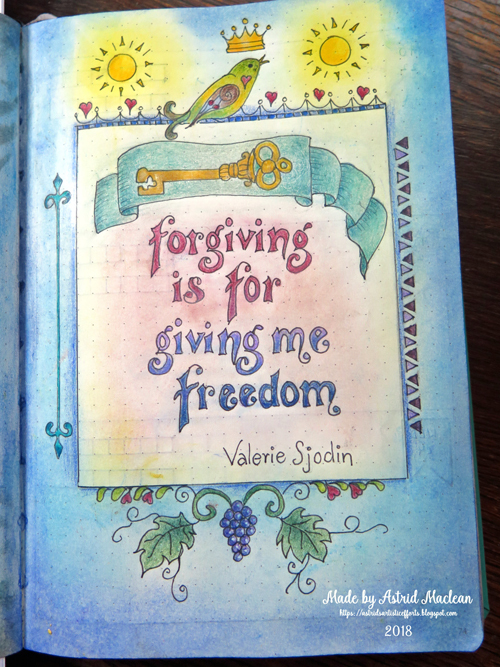 I copied the quote from the Valerie Sjodin colouring book Colorful Blessings. All the rest is my own design. Well that's it for today. 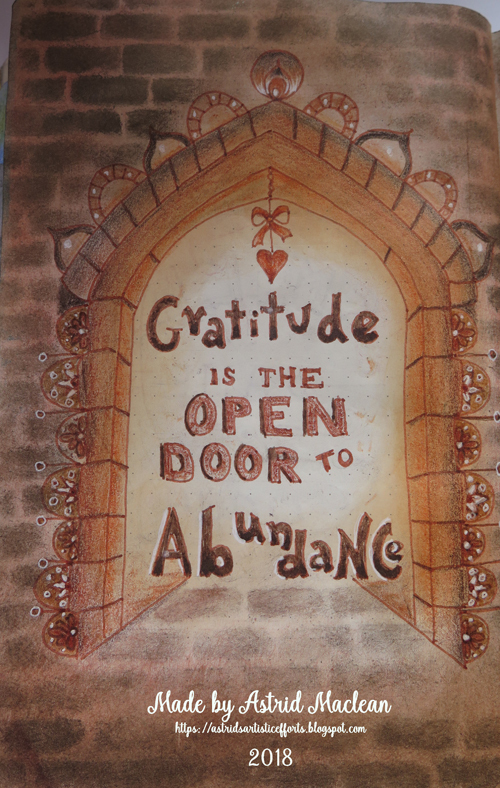 Have a good week and happy crafting and creating! As many of you who visit regularly will know, - I have been using a bullet journal for my planning and creative explorations. 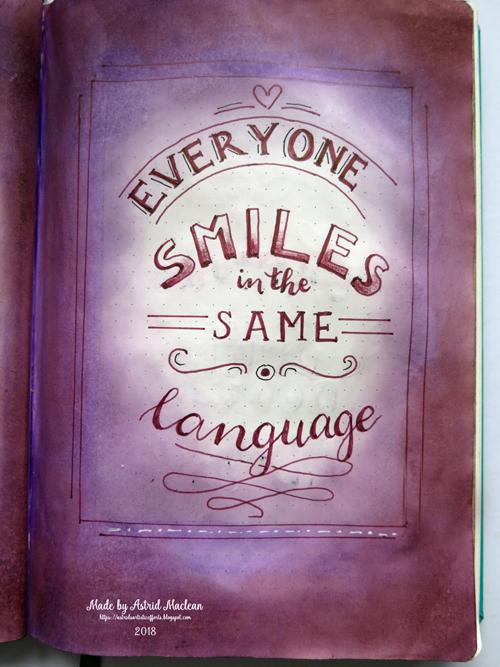 Today I am sharing a few more pages rather different in style. These were inspired by the work of Valerie Sjodin. She is mostly a bible journaler but also keeps a Bullet Journal in a Leuchtturm 2017 (like mine), which she calls her everyday journal. She uses Gelatos and colured pencils to decorate them, and when I saw some of her pages I fell in love! I had been wanting to do some pages with quotes and handlettering and seeing her beautiful work was just the inspiration I needed. Now I have a big box of Gelatos given to me by my dear hubby for my birthday many years ago when they first came out, but they have been sadly neglected for a long, long time, so it was great to dig them out and give them a try in my Bujo. 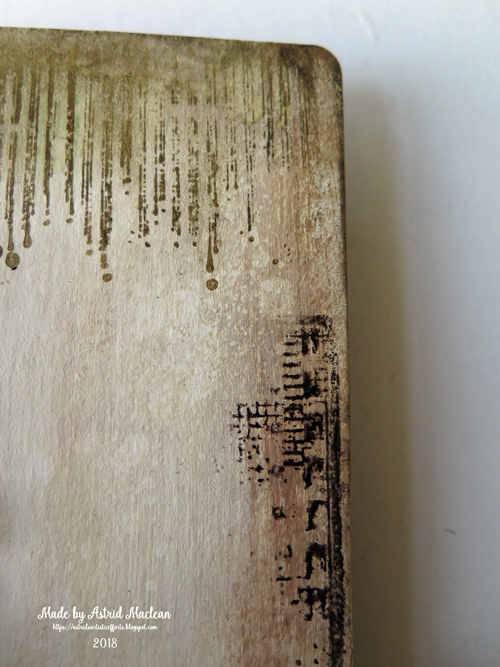 The great thing is that here they are used totally dry just added with a stencilling brush. This is a great advantage as the Leuchtturm as most other Bullet Journals have thin paper only, and they don't stand up to wet media very well. 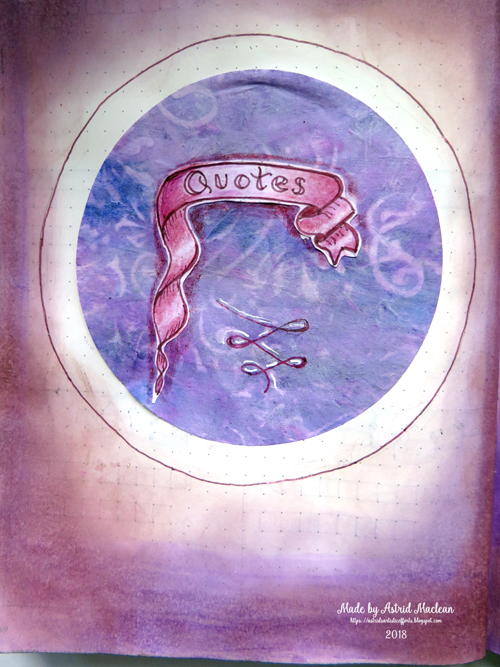 The central circle was done on deli paper with two colours of gelatos and then stencilled with a baby wipe. This is a well known technique, that just lifts the colour.I cut out with the circle with a die and then adhered it to the page with a glue stick. 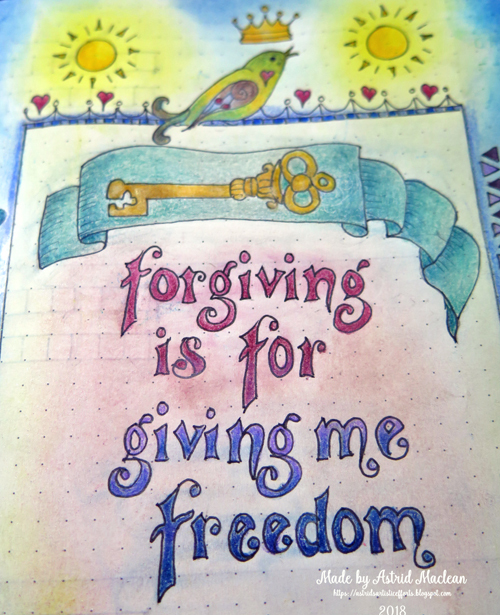 I drew the banner on a piece of paper, copied and adapted from a page on Valerie's blog, coloured with Prisma Premier pencils, fussy cut it and adhered it to the circle. 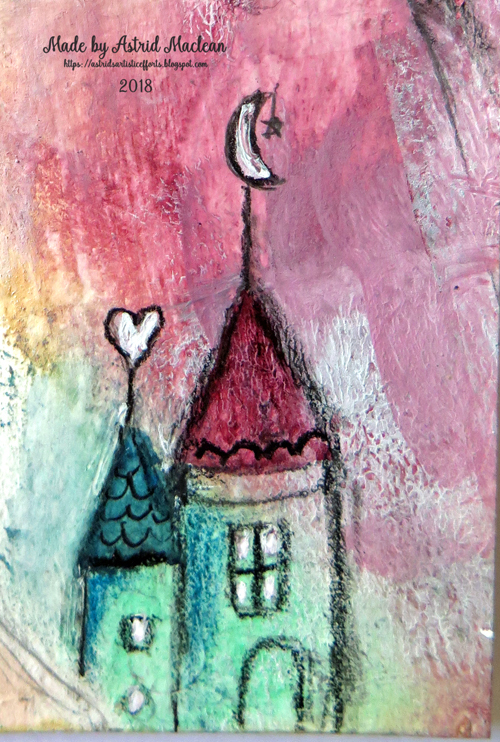 I then blended the rest of the page with the gelatos and stencil brush. 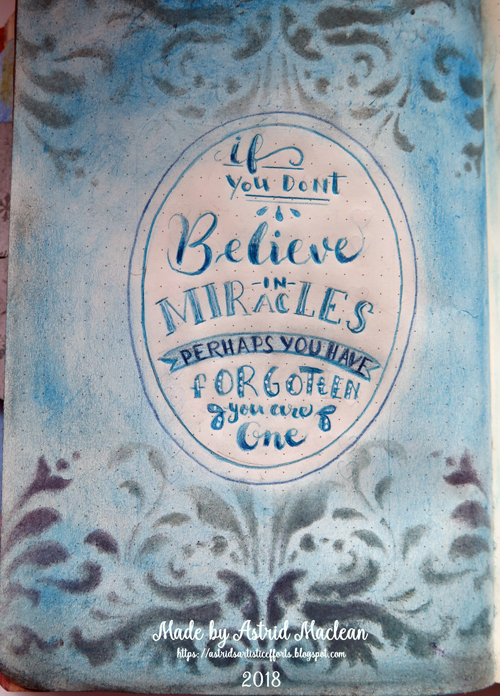 This lettered quote I found on Pinterest, I copied (and adapted it slightly) straight on the page, with pencil first and then went over it with a fineliner. Again, the rest of the page was all done by dry blending the Gelatos with a brush. 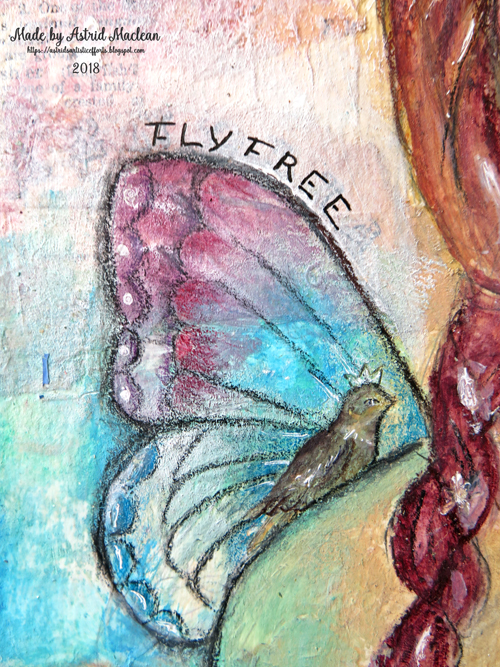 The effect is of course not all that different from Distress Inks, but the Gelatos are more tranlucent I found and have a lovely creamy texture that blends really well with the Prisma pencils. Below, a couple more pages, all done with very simlar techniques. 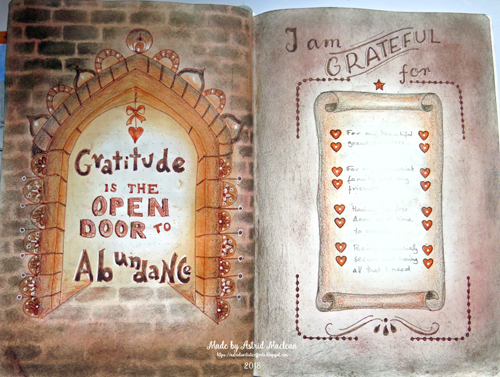 The left side is copied and adapted from one of Valerie's Colouring Books. I don't actually own the book, but it has the "Look Inside" feature on Amazon, so I looked through the pages and then kind of copied one of them, as I loved both the quote and the design. The bricks round about were stencilled with Gelatos and one of Tim's Layering Stencils. The scroll here was again copied from the colouring book but then I designed the rest round about it myself. (Sorry, I digitally obliterated the text as that was rather personal). This final page is pretty much my own design, I just looked at another lettered quote online. The lettering was all done with coloured pencils, which was kind of fun to do. 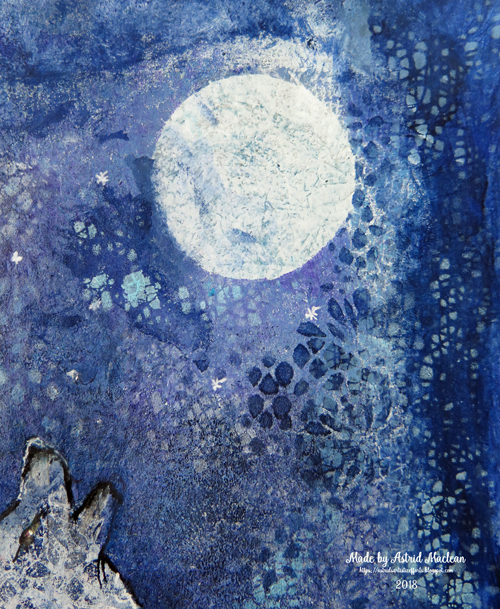 Well that's it for today, thank you for your visit and I hope you have fun with your own art adventures! Hello friends, - today I have another little portrait and some warm up exercises to share. 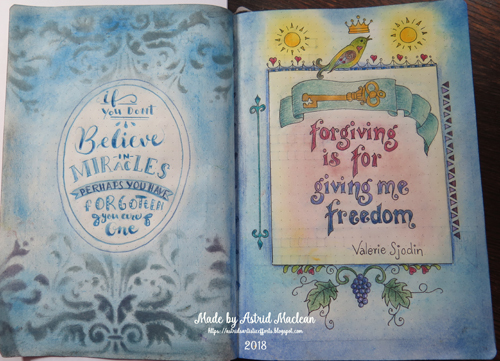 These were inspired by the second week of Lifebook 2018. This week we had a guest teacher, Andrea Gomoll, who inspired us to work creatively with water colour. Loved her class! Here first of all are two warm up excercises, the first one followed her instructions pretty much exactly. I just did it in my own chosen colours and elements. 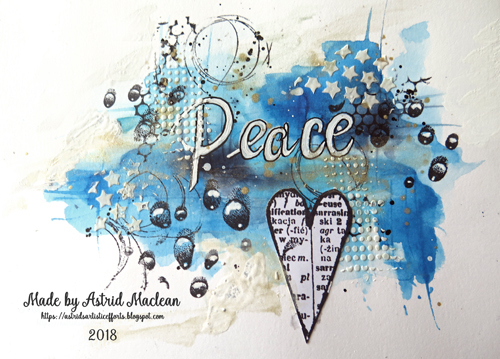 Adding the water droplets was an idea from Shirley Deatcher from Papercreations by Shirley, who is also doing the Lifebook classes. 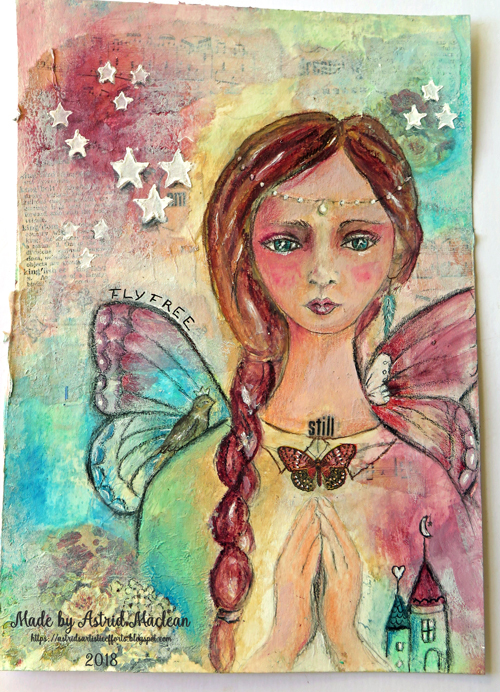 I think many of you will know her, if not check her out, she is an amazing artist! With this next one something went wrong and it became a complete wet mess, so I put some clingfilm all over the wet painting and let it dry. This then gave me the background to add the other elements. Anyway, that's it for today. Hope you are not getting too bored with all my portraits, I am trying to keep these posts short as I know how busy we all are, - but in any case, thanks for your visit, and happy creating! 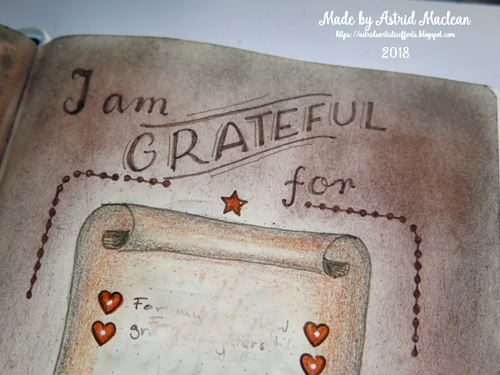 Hello friends, - today I have another journal spread to share, this time nothing to do with Lifebook 2018. 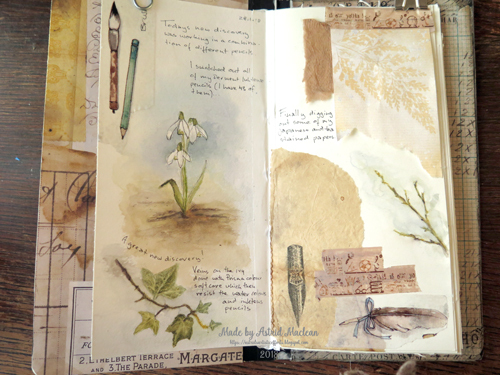 I started this weeks ago in my Jane Davenport journal, and finally got round to finishing it. 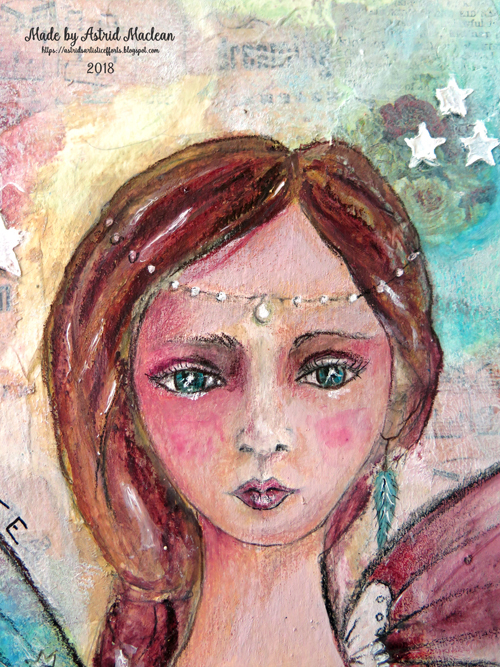 The background was created first, using a mix of collage, acrylic and watercolour paints. 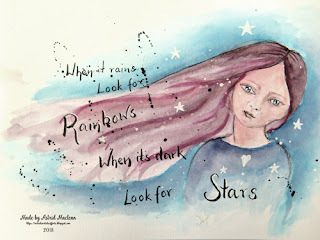 I then added the girl with the help of water soluable crayons, Tombow markers and Prisma colour pencils, plus some Stabilo all pencil and marker pen to add more detail. 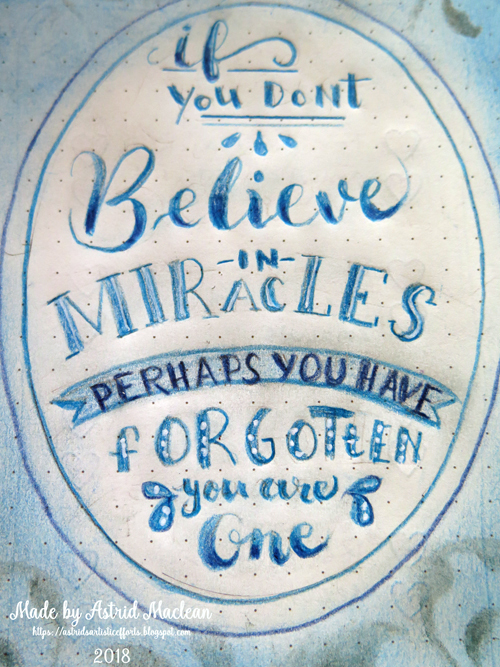 I added a hand lettered quote that I found on Pinterest I think. I love the thought behind it, trying to paint portraits certainly make you look more closely at faces, and the human face, particularly the eyes, always fill me with wonder. 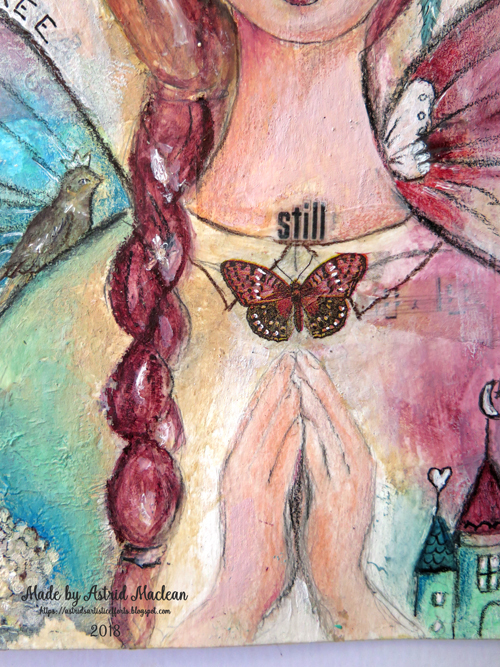 Here is a close-up of the background. 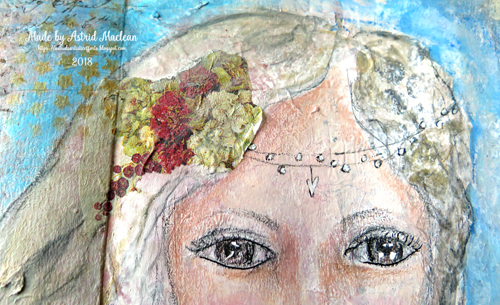 After having completed the face I added some stamping and stencilling. 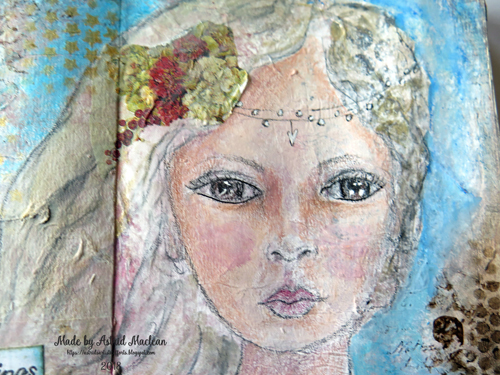 A little tiara on her hair and a scrap of a paper napkin, finished it all off. Well that's it for today. I will probably be back with a few more Lifebook creations in a few days time. Meanwhile, thanks for your visit like always. Hello friends, before I share today's piece I woudl like to welcome all the new followers who have joined me since the beginning of this year. Thank you so much for joining me here. I also want to thank you for your kind comments on my previous page. I love painting these kind of semi realistic portraits, but always have a hard time showing them, as there is so much I still need to learn, but of course, that is partly what this journey is all about. I also attempted some hands (so hard) and my little bird, part of my chosen theme for this year, makes an appearance again too. 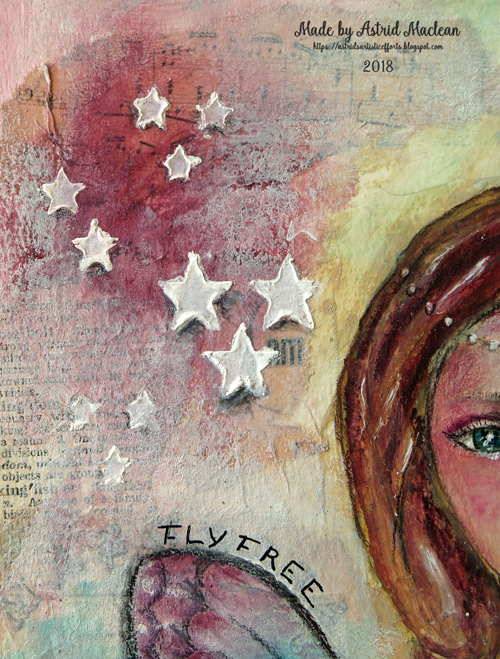 And finally some stars in the background, I love stars, they did not quite come out the way I wanted, - but so be it. Well there you have it, - I followed some of Tamara's example but then pretty much went my own way, just using her techniques for inspiration. 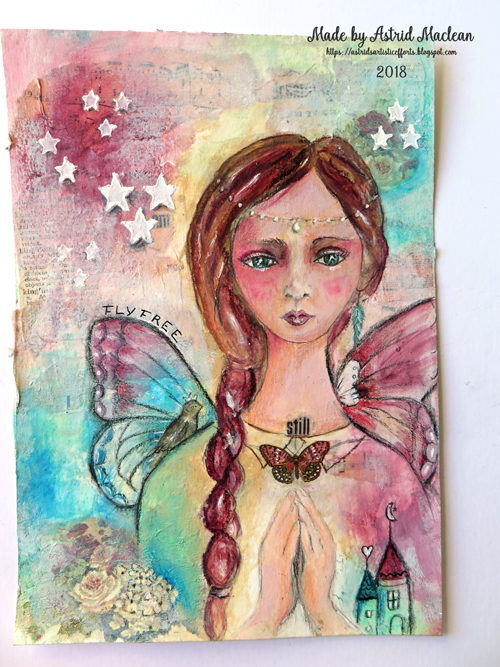 So that's it, my garden fairy, who is meant to be my muse for the coming year, whether she will or not will remain to be seen, - but one thing is certain, I am really enjoying Lifebook, and would highly recommend it to anyone looking for some new art inspiration this year. 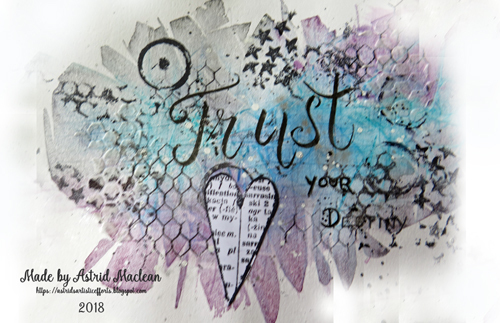 I am linking this piece to Art Journal Journey were this month's theme is "New Year New Adventures"
Thanks for coming by like always, and happy creating!